The MSP Series Multi-Stage Pneumatically-Driven Vacuum Pumps operate on the Venturi Principle. 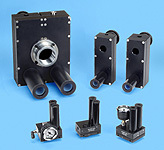 These pumps are designed for applications requiring high flows at moderate vacuum levels. The MSP Series Pumps provide vacuum levels down to 27 in. Hg, and flows to 340 SCFM. The pumps’ highly efficient operation makes them suitable for a wide range of applications, particularly in the packaging and material handling industries, as well as in industrial automation and laboratory environments. The information below is for only the basic vacuum generator with vacuum gauge and muffler. The vacuum control of these generators is served through a manual or automatic control valve situated on the compressed air supply line. NOTE: ANVER MSP Vacuum Pumps have higher flows from 12 in. Hg and compared to many larger vacuum pumps. As this is the operational range for most industrial applications, you may be able to replace your existing vacuum pump with a smaller MSP Vacuum Pump. NOTE: A range of larger models and different styles are also available. Please contact ANVER if you have an application requiring a larger capacity pump or if you do not see what you are looking for listed here. For additional savings, try the MSP Vacuum Pump/Filter combo pack!